The giant pillars of traprock making up The Palisades are a unique and imposing geological formation, offering stunning views of Manhattan and the Hudson River. 42 miles of trails are maintained by 21 Trail Conference volunteers and member groups. Find descriptions of great hikes in this region: click here. Trail Conference News: Revised edition of Hudson Palisades Trails map set published. Some unknown early voyager up the Hudson River named the cliffs of the lower river the Palisades, probably because the giant pillars of traprock bore a likeness to some Native American palisaded villages. The Lenni Lenape, who still survive in Northern New Jersey, called the cliffs "we-aw-ken," the middle syllable of which means "rocks that look like rows of trees." This unique geological formation begins at the Rahway River in New Jersey, crosses the western edge of Staten Island, and continues north along the Hudson River into Rockland County. 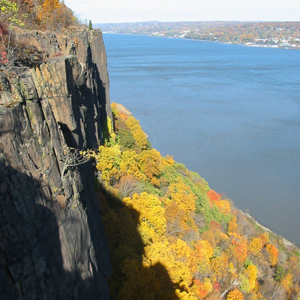 The cliffs are most prominent from Edgewater, New Jersey to Haverstraw, New York, with a brief detour inland at Nyack.